This article was originally published at Infinite Comix on September 17, 2014. Chase Magnett: Every conversation we’ve had up until this point has centered around a period in history, genre, or some combination of the two which Planetary is addressing. 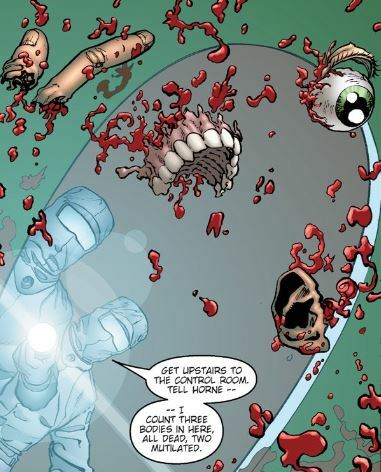 Re-reading Planetary #9, it becomes clear that it is the first issue to break from that pattern in a big way. The issue serves dual-roles regarding the Planetary team, acting as both prequel and mystery. Warren Ellis has never felt the need to hold reader’s hands in a story and John Cassaday plays along with that instinct here. Planetary #9 starts in media res with a different team at a different point in time. Elijah Snow is nowhere to be seen and the change in setup is never fully explored. Even at the end when some flashbacks are revealed, they act as clues rather than a full explanation. The adventure taking place here clearly serves to provide readers with a slightly wider view of the scope and history of Planetary, but never seeks to explain it all. Planetary #9 doesn’t ignore the series central thesis, though. The issue delves into storytelling and the ways in which our artificial constructs connect to reality. The opening page creates a thesis for what the rest of the issue will explore. The image of the rocket ship resting in the side of a house creates a very literal visual metaphor about collisions. Two separate entities have made contact with one another and the results are disastrous. In this instance, the entities are fiction and reality. The house representing the mundane, while a Flash Gordon inspired rocket ship represents the extraordinary. David Baron’s colors are really the key to this page though. He places the earth and the sky in stark contrast to one another with opposing reds and blues. The two ideas are clearly separate, yet still capable of making contact. This is a statement about the nature of fiction itself. Ray, do you agree that this issue of Planetary is fundamentally different from those that came before or am I missing something? Is this opening statement more specific than I am making it out to be? Ray Sonne: Whereas all previous Planetary issues either explored specific genres or just the art of storytelling, Planetary #9 is the first to concentrate mostly on its own story. That story is still wrapped up in the metatextual context of the difference between fiction and reality (it’s even dedicated to writer Grant Morrison, much of whose work is centered on exploring this division), but still sets some exposition for the series’ plot. While Ambrose Chase is called The Third Man, he is to readers the Fourth Man or member of the Planetary team. Unmentioned up until now, he is a look into the Planetary team itself. As we have noted in analyses of other chapters, the Planetary team members often only serve as witnesses to the comics’ events rather than actively participating. Now we see them performing a full “op,” lose a member in the process, and become personally affected by the situation. It is perhaps for this reason that this issue came off as less timeless to me than other issues did. Ambrose Chase’s time-shifting powers, with the bend of bullets included, come off as very early 21st century; what most people would probably call Matrix-esque, but what well-informed comic book readers would more accurately term Morrison-esque since the first famous The Matrix movie “borrowed” very heavily from Morrison’s The Invisibles series. Planetary #9 was published in 2000, a year after The Matrix was released, which squares it firmly in its own time period instead of visiting different eras of the past. There is also, of course, the near open acknowledgement that the Planetary team are fictional characters living in a fictional world. Chase, what do you think of this monologue by “the villain”? The villain plays out the first couple of ideas that he presents, fearing our fiction and simultaneously begging to be overtaken by it. He is not a sane man and it’s in his irrationality that he manages to kill Ambrose Chase. He expects Chase to be coming through the window and prepares to fire on the spot that he will appear. There’s no way for the villain to know this, but he acts upon the idea anyway and this gives him the drop on a man who could have otherwise stopped his bullets in time. The villain’s reasoning behind his success is just as flawed as how he reached the moment. He announces that Ambrose has been killed because he is a black character in a science fiction story. That certainly fits a trope of fiction, but one that is far from a constant. It certainly doesn’t hold true in reality and — while prevalent in many science fiction stories — is hackneyed and far from universal. Jakita Wagner appears as the voice of reason when she murders the man who killed her friend. The villain explains that he is a necessary component of the story, as only he can explain what has happened. Jakita rejects this notion outright and murders him. Fictional tropes do not define reality. 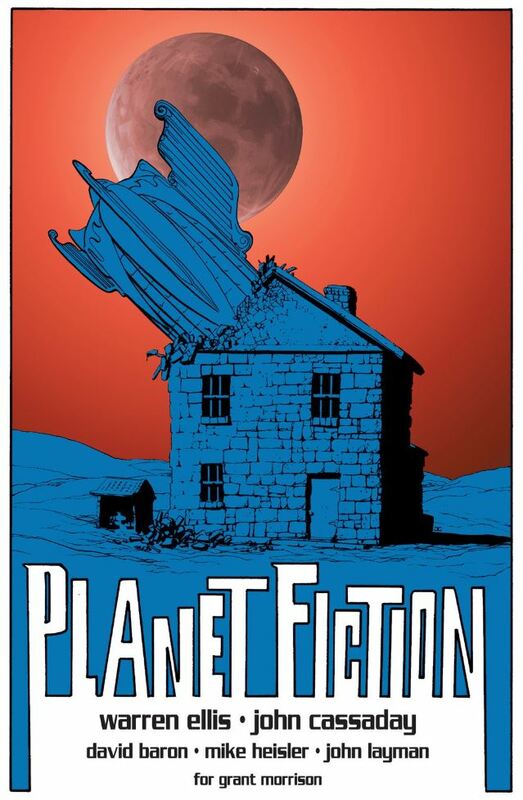 They do not even necessarily define fiction, as this ongoing story thread within Planetary will prove. The last thing mentioned by the villain is what really interests me, though; the want to see what is inside of fiction, to know how the sausage is made. Ellis possesses no qualms about criticizing the comics industry and has done so before in Planetary. Here, he is providing some subtle (or not-so-subtle once you notice it) commentary on how work-for-hire comics are produced. The Fictional Man brought back from Planet Fiction was created by a team of creators, all of whom were ultimately serving another master in creating him. They were given rules in which to work and were killed (the worst way to be fired) on a whim. The villain mentions that the spacecraft probably landed on the farmhouse because one of the creators was born there, that the creator was attempting to leave his mark on something that he did not own. This is without a doubt a commentary on work-for-hire comics. Creators attempt to create a lasting impression on something they never owned to begin with, and could be removed from without a moment’s notice. It’s a potentially brutal arrangement reflected in Cassaday’s gorey panels. Grant Morrison is one creator known for leaving lasting effects on work-for-hire projects. What kind of commentary do you think this makes about his and Ellis’ own work at comic publishers? RS: Morrison is a creator with a lasting imprint on the DC Comics multiverse currently. Although The Multiversity has only just begun at the time of this writing, the map he prepared with Rian Hughes is confirmed to work as a guide for the future for DC’s editorial. As of the time of Planetary #9’s publishing in 2000, however, he had not gained such distinction. While he had critically acclaimed runs on Doom Patrol and Justice League by that year, DC hadn’t yet given him the opportunities to write stories such as All-Star Superman and Batman, Incorporated. We know that he had more of a say in DC’s canon by 2008, when DC published the crossover event Final Crisis, but not necessarily much sooner than that (52 was a writing team endeavor and Superman 2000 was a similar writing team-oriented pitch that was rejected by DC’s editorial). As for motion of superhero comics “creative teams”, I’m not really sure the erasure of the creators is something too emphasized when a lot of the focus is placed on the Planetary team. Maybe we can call it a call-out, but not quite a theme. Looking at the pacing for Planetary #9, it’s admirable how Cassaday keeps each panel feeling high-action. It doesn’t feel natural to read this plot slowly because it really is all about beating the stuffing out of the opposing side. With all this talk about Morrison and Ellis, it makes me wonder how I have not seen as much of Cassaday’s work as I’ve seen of theirs. Although he does do superhero work-for-hire, he is very much known for Planetary. If anything, especially in this day and age where writers are sometimes credited by uninformed readers for every single part of the comics down to the lettering, the rapid change in creative teams seems more potentially damaging to artists than it is to writers. There might have been outcry when Todd MacFarlane left Spider-Man and Jim Lee left X-Men back in the early 1990s, but the era of rockstar artists is far enough behind us to warrant its own Planetary issue, if only the series were still ongoing. On the other hand, having Cassaday’s biggest influence on the medium (as what is by all means an original series) could be seen as an inkling in the year 2000 for how the industry looks today. Superhero comics could arguably get away with any mediocre element — from inconsistent writing to shoddy pencils to too-constrictive editorial — and still sell well. But original and creator-owned series need to have everything at their best, with a lot of luck along the way. Although we have spoken about a lot of comic book writers “leaving their mark” in this chapter’s analysis, I think the power of this series was very often in Cassaday’s hands — possibly at times more than it was in Ellis’. 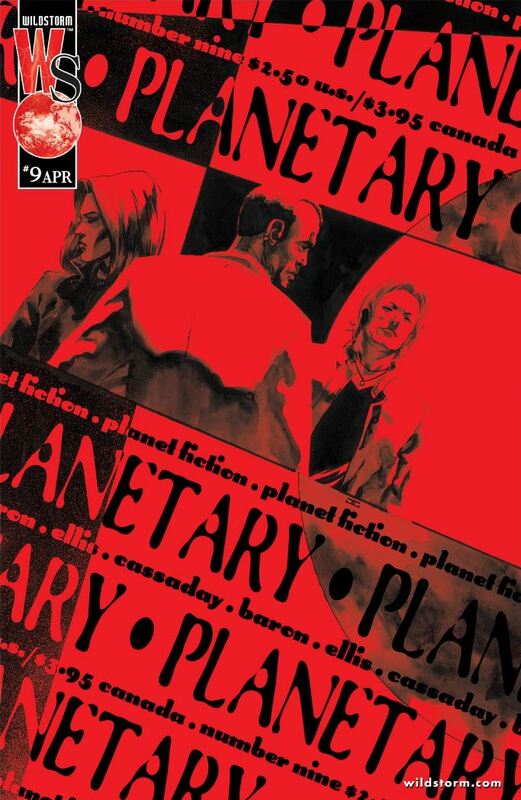 Ellis may have said in his proposal for Planetary to Wildstorm’s editorial that “It is intended that the covers be like no others in comics, and that PLANETARY will be a beautiful, unique and instantly recognisable object on the stands. Simply put, the covers will change radically each issue”, but Cassaday was the one to execute this intention every single month. I don’t think I need to make reference to the interiors of these comics because Chase and I try our best to go over them with a fine-toothed comb, even though sometimes there aren’t words to properly express our awe. This is going off on a tangent unrelated to the series at hand, but the point of the matter is this: John Cassaday, we salute you. – The first big hint at the Fourth Man’s identity is made here when he recommends a wardrobe to Ambrose Chase. Ellis understands how to compose a mystery and makes sure to provide readers with clues and suspects before the eventual reveal. – Cassaday is a master of creating horror by not revealing the full picture in this issue. In multiple panels he shows just enough for reader’s imaginations to run wild and construct images far worse than he could have drawn. The worst of these comes in the imagery of a crushed crib with specks of blood and a teddy bear lying by its side. The thought of a dead child can be more effective than the actual illustration. – Here, we finally learn why The Drummer does not accompany the field team on high risk missions. The last one he went on ended with a friend dying in his arms. It’s a gut wrenching moment and one that finally provides some insight into Drummer’s psyche. – Upon opening the door on the ship, one of the people in the panel says, “I can hear something…not quite music…” In DC Comics events Morrison has written, such as Final Crisis and The Multiversity, music — or different vibrational frequencies — is fundamental to the building and traveling of the Multiverse. The Wildstorm Universe, where Planetary is set, is part of the DC multiverse as Wildstorm Productions was owned by DC. 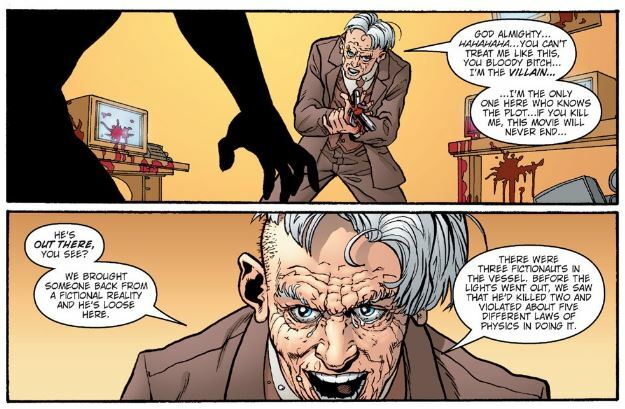 – This is not the only time Ellis has referred to musical universes in his Wildstorm contributions as The Doctor rescues an impulsive Apollo in The Authority by temporarily entrapping him in a world of music. thanks for this article. I’m currently reading Planetary and just finished this issue #9. I already feel the need to reread this series when I’m finished. If a creative team can force me to do that and still enjoy the work several times over, I’m completely satisfied and give as much praise to the creative minds behind this masterpiece by expressing it to other comic readers. “GO BUY THIS RUN”. Much like Morrison’s work, this issue left me with some questions. I find tho that if the art isn’t as powerful as the writing, I can be easily turned off. Cassidy and Ellis are at war here to see who can better the other and in end result we are given excellence in comics and its a draw. Thanks again for the insight on this book. It was very helpful.